FLV known as the most used video format for the online websites especially used by YouTube to play videos but among the offline video users this format is not much popular. Many mobile devices and PSP doesn’t recognize this format on the device to play videos of this format. The same happens with the windows computers as well. It is only possible to watch this format on windows that you have to convert it in the windows media video format which is also known as WMV format. To convert FLV to WMV format you can go through this guide. KeepVid Online Video Converter, as the name of this software says about this converter, it can convert the videos online using a browser only without any installation on system. This online converter website is an easy to use and very user friendly website without any ads, banner or unnecessary videos. It supports to convert videos in 60 formats. The best part is that it is FLV to WMV converter free site and can be used totally free of charge. Simply select the FLV from system and upload it to website then select the WMV format from list and finally click “Convert Now”. That’s it. KeepVid Video Converter is a perfect and easy to use converter program which can perfectly satisfy all your video conversion needs. It fully supports all modern audio and video formats to convert files. 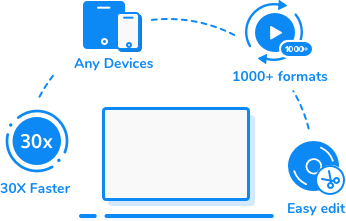 KeepVid Video Converter program is developed by the experienced team of KeepVid and fully supports video recording, video downloading, video conversion and video editing. Finally we can call it a complete video toolkit to help you out. Convert FLV to WMV, MP4, or any other formats as it supports 1000+ formats.  Convert the video or audio by choosing the output format from the device list. You can do multiple video conversions together in batch without any limit. Download the multiple videos together from different video hosting sites. Advanced conversion technology of the program can convert files by 30x faster speed. Step 3 – Lastly, select the preferred file format, i.e. WMV, from the available audio formats and hit “Convert Now” button. In order to convert FLV to WMV with the program download and install it on your computer. Once installed launch and click on “Add Files” button or you can drag and drop FLV to the functional area of convert tab. You can add multiple files together to convert. It supports broad audio video formats to convert files so carefully choose WMV format from the list. To choose WMV format, in the top right side next to “Convert All Files to” click on upside down icon and in the “Video” tab choose WMV format. 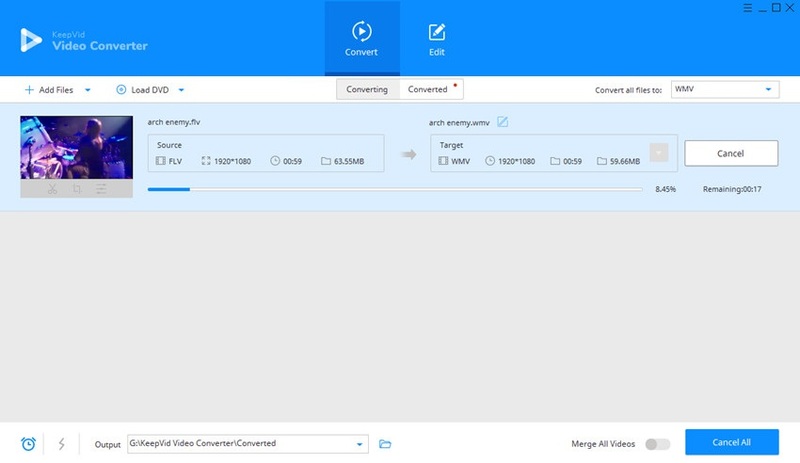 Now everything is set and you can click on “Convert All” button to convert FLV to WMV format. WMV is an extension for the Windows Media Video files. WMV is developed by the Microsoft to store the videos on windows operating system devices. Mostly all versions of the windows operating system comes with preinstalled Windows Media player which can be used to open this file format. Windows Media Player is discontinued for the Mac OS so Mac users can use Flip4Mac to open WMV files on Mac but this is not free you have to buy it to use.